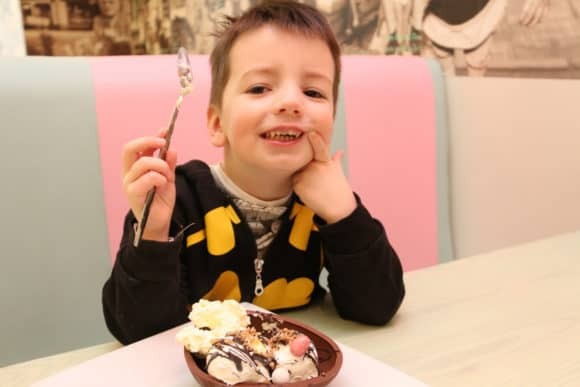 An Easter egg sundae will be the sweet treat for the winner of a competition running as part of Wellgate’s Easter week of free activities next week. A collection of cracking animal-related Easter activities will be on offer at Wellgate, from recycled art and a communal elephant, to a truly egg-cellent LEGO workshop! From Monday 4th until Friday 8th April 2016, it will be sunny side up for children and families, with a varied programme of free things to make, do and learn. All events will take place on level 2 near BHS and New Look from 11am until 4pm. The week kicks off on Monday 4th with a recycled arts and crafts workshop, with the opportunity to create some animal art, from egg box crocodiles to paper plate lions. Then, on Tuesday 5th, there’s a dinosaur and animal LEGO workshop, where children can let their imagination run riot constructing their own dinosaurs and other animals. More animal creations can be crafted on Wednesday 6th, this time out of sand. And, on Thursday 7th, there’s a chance to make and take away your own Decoupage animals, and help decorate a communal elephant. Rounding the week off in spectacular style will be a circus skills workshop on Friday 8th, where children can learn how to juggle, spin plates and much more! Meanwhile, on Tuesday and Thursday, there will be a chance to ‘meet the maker’ of delicious Jannettas Gelateria ice-cream, with free samples and a prize up for grabs for the best colouring competition entry.. the chance to enjoy an Easter egg sundae at Jannettas Gelateria, St Andrews. Balloon modelling and face painting will also be on offer and, on top of all of this, drawing materials will be available throughout the week. There will also be a fantastic prize draw, with a number of family friendly prizes up for grabs.